The client’s were building with Cardinal Crest Homes, one of our favorite builders in town (remember our project with that teal island? ), in a super cool neighborhood where modern row houses were making their debut. After meeting the fun and stylish couple and looking over the floor plans, the inspiration was already flowing. They had already completed most of the structural design decisions and material selections for the home, which we were totally digging (hello Navy cabinetry!). That, along with some photos of the clients most coveted existing furniture pieces and a chat about their overall style set the groundwork for our part–-lighting, furniture, accessories, and wallpaper. The clients already had this beautiful dresser, pictured above. The clean lines and warm texture acted as the inspiration for the master bedroom. We carried in the warmth by adding complimentary wood pieces in the bedside tables and bed bench, while emphasizing the clean lines of the construction details from the gridded headboard wall with the table lamps and shapes of the furniture pieces. Texture in the pillows and bedding helped keep the space soft and inviting. While we wanted the spaces to be stunning, livability is always on our minds, especially for fellow dog lovers. We created an overall design concept for the home, playing up the already clean lines of the construction details and emphasizing the textures and materials that ooze mid century modern. While we wanted the spaces to be stunning, livability is always on our minds, especially for fellow dog lovers. 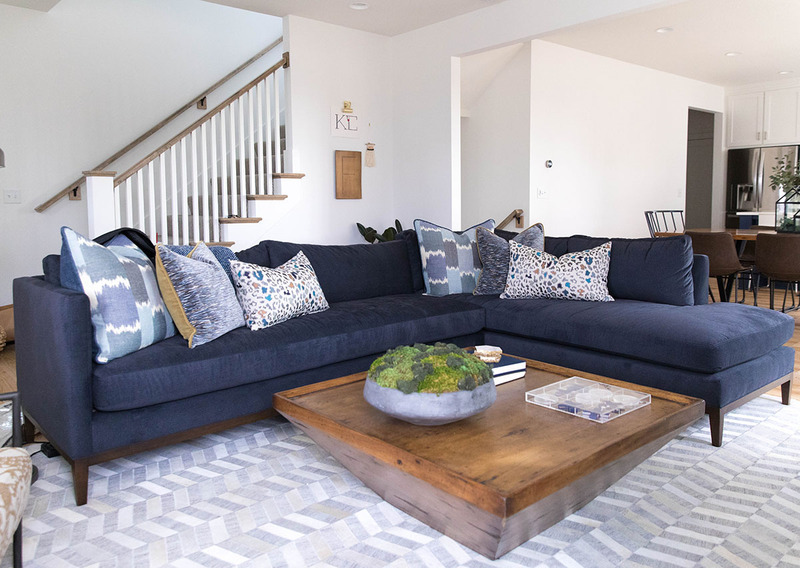 We selected materials that were pet friendly and durable in the living spaces, while adding boldness in colors and patterns (have you seen the powder bath wallpaper?!!??!!). We finished it off with some eye-catching lighting and played with mixed materials and personal touches for the accessories. Bold patterns are brought into the home through the striking wallpaper in the powder bath and pillows in the living room. Warm textures are carried throughout with the powder bath mirror and details on the window bench in the living room. 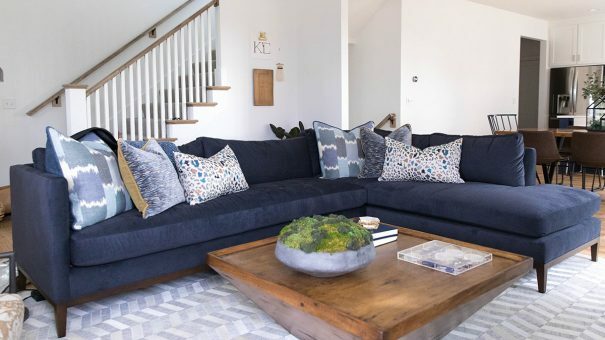 The navy cabinetry is complimented by this bold hue of blue on the cozy sectional. The fabric is not only soft and snuggle worthy, it’s also durable and made to live on. The patchwork cowhide rug and solid wood coffee table bring in texture while also keeping the fur babies in mind. To see how this all came together, check out our ‘Behind the Scenes’ video of install day at Shoal Creek Village! And finally, the results and the client reveal and reaction!